Last week our Verizon DSL line died one night, and I needed to call tech support to get it all fixed. Unfortunately, usually I get the tech support number from the Verizon website, and that clearly wasn't gonna happen. So I dug up the initial stuff they snail-mailed when we started the service. 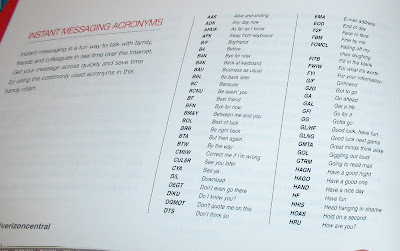 In the booklet with the contact numbers I noticed a special section called "Instant Messaging Acronyms." It is filled with all sorts of helpful "commonly used acronyms" you can use to "save time" whilst chatting with family and friends. Things like, "LOL," "BTW" and "IMHO." However, it is also filled with all sorts of wild acronyms that I've never seen before. Now, I don't consider myself an expert on IM acronyms, and it's possible that new ones have been developed recently, and that I'm an old fogey by IM standards, but: Have any of you ever seen "PMFJI," "SSINF" or "OTTOMH?" And then they go and get a few classics totally wrong. For example, "WTH." The family-friendly Verizon acronym page writing people just couldn't bring themselves to put "WTF" in their little guidebook. "WTH," they claim, stands for "What the heck?" Two weeks ago I posted about me and some fellow aerospace students experimenting with rockets. At the end of this post I had a picture of four rocket engines, at a family reunion this weekend I shot them off. Unlike last time I can post these on Youtube with no editing. I will not go a big rant; I will just post the videos (note I have not posted them in order of when they were launched rather based upon how well they launched). My sugar fuel had to much sugar so it acted more as a smoke bomb with a lot of flame, I think the second sugar rocket lifted of because of a bit of black powder I had in it. 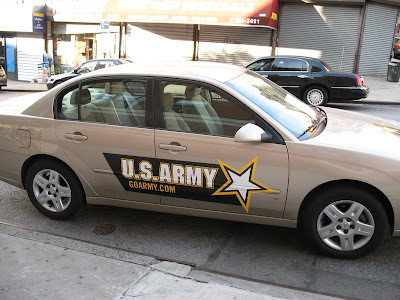 I estimate that my second black powder rocket hit around 200-300 ft.
Before showing you my room I have to thank Adam for letting me drive his car round the block (including one big roundabout!) early one morning. And once I did find myself on the wrong side of the road after a turn . . . it was wicked! In a turn of events that is not worth describing, I've acquired a new dorm room. Words really don't justify it so take a look at the picture. The Rumford fireplace unfortunately has the chimney stopped up, but the one in the room next door works well. Take a look at the ceiling, has patterns where chandeliers probably used to be, the design matches the arch over the fireplace. 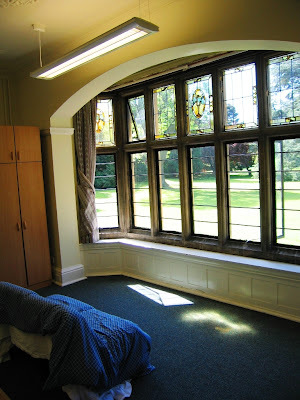 This is another view of my bay-window and improvised couch where you can more clearly see the stained glass. Note: Before getting too excited about the sun, it has been sunny for only about 3 days since I got back. 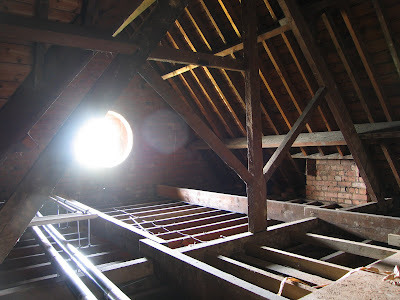 This is the attic, it didn't take long for me to find the way up, but it was less interesting than I had hoped. 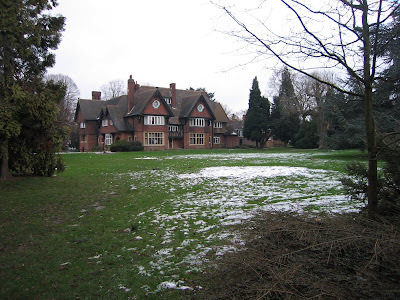 This is the view of the house from the outside, my window is the one on the bottom left. Well the AIAA didn’t go to the plane competition this year, this was due to a combination of the fact that we basically ran out of time, we couldn’t fund the transportation costs to get to Texas, and the competition was in the middle of our exams. Regardless of this, we decided to proceed with the construction of the plane; the purpose of this was for the club members to gain construction experience, and so that we could test the design to see what we would want to change for next years plane. Additionally, we can use this year’s plane as a test platform for next years design changes. Besides overseeing all the construction for this years plane my project over the past couple of days has been how to mount the tail control surfaces to tail boom. On Friday I came up with a design, we discussed and then modified the design. Yesterday I cut out a test piece; from this piece I realized that I had to slightly modify my dimensions. So, I went back to the computer and fixed up my CAD drawing. Today I completed the part, it took me about three hours to do it, this included sketching the part on a piece of sheet metal then cutting it out with a band saw and finally with a hammer beating out the final piece. I don’t have a picture of it with me, so I will post the 2D expanded CAD view of the part. Welcome to Holland, here you see a farm that has been raised only like 1 ft. above the artificial sea level. The place is full of long thin really artificial looking fields, beautiful though. This one is near a dike, on the other side of which the sea is like 10-20 feet higher then you see it here. And a classic windmill. The sides and roof are thatched . . . weird. You will have to come visit me to see the rest of my general Amsterdam photos there are too many, but for now lets focus on the title of this post, see in Amsterdam everyone bikes everywhere. I apologize in advance for not knowing any of the people in these pictures- is it ethical to put them online??? That would be a three story parking lot for Bikes (notice the British word "Car Park" is too restrictive in this case). I think its pretty clear whats going on here and I don't think he's the first to come up with the idea. This one is more like the Dutch Pickup truck, the baby rides in style. The older kids get a forward facing upright seat in front or in back of the Mom. I.E. 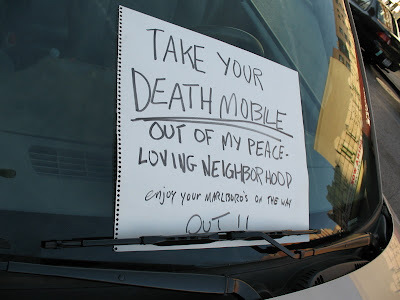 Dutch Minivan. Its quite rare to find kids in one of these, but they look like they're having fun. 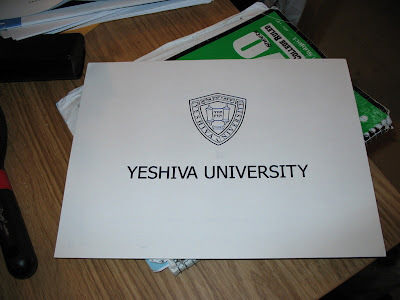 Today was Yeshiva University graduation. Believe it or not, I finally graduated from YU. See! I wore the stupid costume and everything. And I even got a diploma! 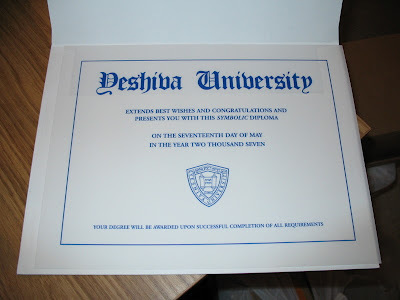 Yeshiva University extends best wishes and congratulations and presents you with this symbolic diploma. 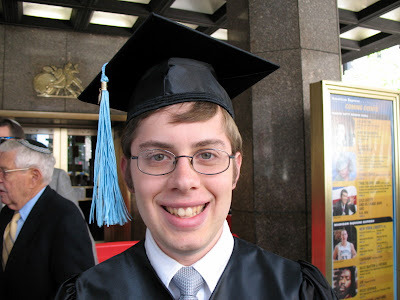 However, I am glad to report that (assuming I do in fact graduate) I'll be starting grad school this fall at The City University of New York / The Graduate Center / City College of New York (I haven't really figured out how that bureaucracy works) pursuing a PhD in physics. They say a picture is worth a thousand words, but I always felt that this depended upon how many words you really wanted to write about the picture. However, I do think that what I am holding says all the words it needs to. 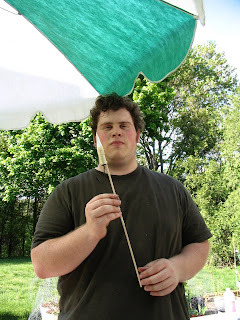 It is in fact a small, totally home made rocket; this includes the propellant which I made. The fuel is Potassium Nitrate (KNO3, Saltpeter), and table sugar (there are trace elements of Carbon and Sulfur). This may surprise you that the rockets propellant is made out of sugar and fertilizer however this is a very well documented amateur rocket propellant (sometimes called Candy Propellant). Anyways I mixed the dry powder with some alcohol and using a rod to maintain a hollow core to the engine; I packed the mixture down with another rod and let it dry. I then put a nose cone on it and installed a fuse and the wooden stick that gives it stability in flight. Then it was put on our launch rod and prepared to be fired; I lit the fuse and ran. You can see the length of the fuse in the picture and it wasn’t long enough so I didn’t actually see it go up. But the other observers say it went well over the tree line so I figure maybe 100-150 ft for my first ever rocket engine I was very happy. 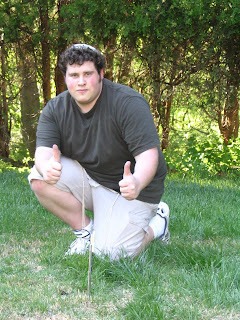 We tested other rockets that day with varying success. 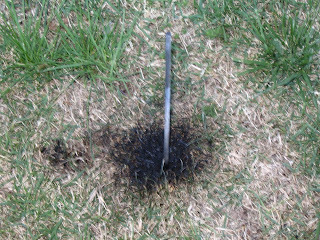 One rocket started to thrust, flew about 8 ft in the air and fell back down having run out of thrust (this was due to poor packing of the fuel, in this case black powder). 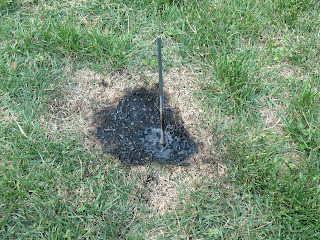 The other rocket had an experimental nozzle on it, however this just resulted in pressure building up until the nozzle blew out, and the rocket got tilted when this happened; the result a rocket streaking across my backyard at about a 45 degree angle to the ground. The ultimate purpose of these activities is to start a rocket group within the Rutgers AIAA club. However, the people I did these activities with asked to be not named, because of this I cannot post the video we took until I have had time to edit them. However you have something to look forward to. Launch Control, if you look in front of me you will see the rod with the rocket on it even though it camouflages with my shorts. Launch Control by the end of the day, you can see the scorched ground below the laucnh rod. Also, you can see some of the sticky sugar from the fuel stuck to the rod. I would like to make sure it is clear that we had my mothers permission to do this, and she watched on all our launchs. These are four more engines I have made since that day. 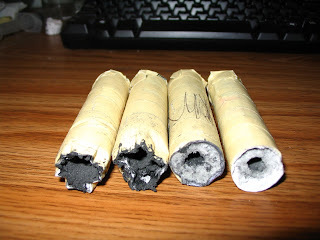 The two on the left are black powder, the one second from right is mostly sugar fuel with a bit of black powder (I ran out of sugar fuel) and the one on the right is all sugar fuel. PLEASE NOTE THAT THOSE WHO PARTICIPATED IN THE CONSTRUCTION AND LAUNCH OF THESE DEVICES WHERE VERY CAREFULL. THIS SHOULD NOT BE ATTEMPTED BY PEOPLE WHO DO NOT UNDERSTAND THE DANGER OF WHAT THEY ARE WORKING WITH. THESE ACTIVITIES SHOULD NEVER BE UNDERTAKEN WITHOUT ADULT SUPERVISION. Oh . . . yeah, I actually went to Candyland, not Spain. (Look carefully way in the back and see the medetiranian). Anyway, this whole post is actually all about Barcelona in Spain. This is me in a Gaudi building. Look up the dude, he's nuts- but in a cool way. The hat and Umbrellas were chained down- hence the weird pose. Well I am finished with final exams, and now its summer vacation. So I will now talk about something else. In fact when I say I am going to talk about something else I mean something that happened two months ago. Two months ago Eli posted about a neutron howitzer titles Nuclear Physics, what you probably didn’t notice was the top center ad. Now normally Google ads have something to do with what is actually in the most recent post, in this case however I have no idea how they got this particular one. I'm back in Leicester, and I guess your all expecting to hear about my trip . . . well your in luck because I expect to be blogging about it for a while. Now I used about 3.5 gigs of space for pictures so I'll try to put up the better ones. When making the final, please remember that this is INTRO to physics, and not for physics majors. Think about how easy intro to biology, and the other intro/NON Major classes are… and try to apply that to our class when grading and creating an exam. I do not know if you are aware, but there was a fire early last night in the library- significantly hindering mine, as well as many other physics lab students ability to study.... please take this into account when counting / grading the final. Also, I do not know if you are aware, but radioactivity was not covered in lecture at all; buoyancy, sounds, and fluids were all topics from last semester. 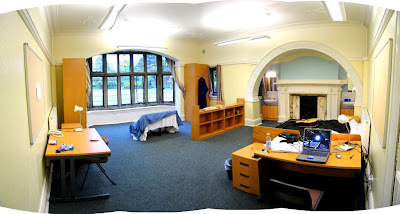 A fire in the library! WHOA! That's serious business (although a lame excuse). I called the library to verify that there was, in fact, a fire. The librarian was like, "Fire? In the library?! Not that I know of." Now, that tells you something about the seriousness of the fire. But I wanted to be sure, so I called YU security. Sure enough, some modem short circuited and started smoking. The library was evacuated for a few hours. If the few hours the library was out of service has truly affected your mental state for the upcoming exam, I feel that you might want to contact YU's counseling services: http://www.yu.edu/counseling/ If there is an issue, I'll be more than glad to accommodate. I am aware that radioactivity was not covered in lecture. However, as your grade on that lab (~[grade]%) was above the average grade for the rest of your labs (~[grade]%), I can only assume that you have a strong handle on the material we covered in that lab. Regarding your last comment (which is similar to the one you appended to your last lab report), I am, in fact, aware that the course is a 1 credit course for non-physics majors. However, the one credit hour that this will count towards your GPA is weighted the same as one credit hour for the "for majors" lab and the same as one credit hour of any of your other classes. Also, to the best of my knowledge, the credits assigned to a class do not determine the difficultly of the class or the thoroughness of an exam, but rather the length of time spent in lecture/lab. Additionally, as the course is an intro course, and the labs were intro labs, the final is an intro final, and I believe it will yield an accurate measure of how much you've learned through the semester. However, I see no reason that an intro course final should be more or less difficult that an advanced course final - the only difference is the level of material covered. I hope this has clarified any issues you were having regarding the final. See you tomorrow. Well sadly my Rutgers Screw incident worked out just fine for now, with very little effort I fixed the problems. This is no fun; however I did have a good story to tell. This is how it works as many of you know a person who goes by the name notelon comments very often on this blog, what you may not know is that like me he also goes to Rutgers. He however has a much better end result Rutgers Screw Story then I have, additionally I don’t think any of you can complain about his grammar or spelling (or not nearly as much as you complain about mine); So without further ado. I assume all of you noticed I am not Aryeh. You may well wonder why I should be allowed to post then, considering I'm not a Lansey Brother. Well while it is true I am not a Lansey brother, I am a brother (Just ask notDaniel), and just as there is a Lansey who is not a brother, and she posts sometimes, so too a brother who is not a Lansey can post sometimes. Now on with the post. I too have a story about the RU Screw. You see, I am a Chemical Physics major, and as befits Chemical Physics majors, I wished to sign up for Chemistry and Physics courses. Oh, and math too. Math is always good. So I checked the course catalog for Chemistry, Math, and Physics Courses. It was quite a decision process, but I was able to narrow it down. I chose to take Atomic and Molecular Structures, an appropriate course considering my research. I also took Chemistry Seminar, not that I wanted to, but it was required. Philosophy of Physics is a senior level philosophy course all about Zeno's paradoxes, which even the Ancient Greeks with rudimentary knowledge of math did not find convincing. I also wanted Math Reasoning, Intermediate Quantum Mechanics, and of course Honors Research in Chemistry. Not a bad course load. So far so good but then came the RU SCREW. Gasp! Yes, when I tried registering for the courses, I found I could only get two, Atomic and Molecular Structures and Seminar. The others all failed to go through the system. For starters, you can't take Intermediate Quantum Mechanics without Elementary Quantum Mechanics. Fair enough. And I don't actually have to sign up for the research. But why couldn't I take Math Reasoning? Does it even have a prerequisite? Indeed it does. Basic Calculus, and don't think for a second that Differential Equations cuts it. You need Basic Calculus. Of course I got into Differential Equations because I had advanced Calculus, and I got into Advanced Calculus, because at that time I had Basic, but I don't have Basic now. So I'll have to go to the dean. Proceeding to the next course, we find that I don't have the prerequisite for Philosophy of Physics. What prerequisite is that? Oh just a physics course. Doesn't a Chemical Physics major have physics courses. Well yeah, but they're not the right physics courses. So again I'll have to go argue it out with the dean. I bet you thought I could just go to the dean and ask nicely to fix the schedule. Ha, not in a million years. You see the dean can't fix anything, unless you already have a full schedule. The theory there being that if the dean can't fix the problems, at least you are already registered for classes. But of course, I couldn't fill my schedule, unless the dean fixed the problems, and I couldn't see the dean, unless I filled my schedule. That's one bad catch-22. Well there is one way out. If I registered for other classes, then I could see the dean and register for the classes I want. Of course I would need the prerequisites for those other classes, and they couldn't conflict with each other. Those requirements effectively ruled out any classes in the sciences, and I was distraught. But at last I came upon an answer. I was taking far too many science courses, but my knowledge of culture was dim beyond compare. And is not college the place to enrich yourself? So I decided to register for some classes on culture, and fill in my deficits. Of course this was difficult, as I didn't have the prerequisite for Advanced Applied Tuba, say. And The Nature of Politics conflicted with Chemistry Seminar, and even Chemistry Seminar is more interesting. But eventually I found the classes to tame my wild uncultured heart. First off I had to take Elementary Hungarian. I mean there's this big country near Austria and Romania, and uncultured buffoon that I am, I don't speak a word of the language. Dance Appreciation was another must. Thinking back, I never really did appreciate dance, perhaps because I am clumsy. But it's high time I learned. But the real score was Feminist Practice. I am a Chauvinist Male Oaf, and that is unacceptable in our modern world. I must learn to tame my masculine aggression with feminine intuition. Only then will I be an acceptable modern man. And you thought knowing how to do the dishes was enough! So now that I registered for all these courses, no longer am I a scientific savant. No, now I have culture. Indeed, I have truly become a Renaissance Man, a real polymath. Until I sign up for the science courses and drop this garbage. Then I'll be an elonmath. Bottom Line: you can't go through Rutgers without hitting the phenomenon known as the RU Screw. It is so prevalent in Rutgers Society, it even made it in the Alma Mater. Well that’s just the way it’s ran. So ends notelons bit, however I did tease you with the idea of an Archimedes Screw so here is one.